Our Rob has long said that Europa Universalis IV played like an RPG in which you rolled as a country. Paradox Development Studio seem to have taken that observation to heart, graduating from grand strategy to straight-up fantasy roleplaying in Runemaster. 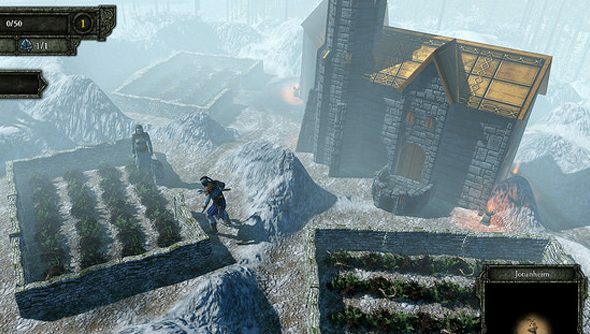 Runemaster is an RPG split between exploratory questing and a tactical battle map, set in a fantasy world that draws on Ragnarok and the rest. Paradox say Norse mythology is “at once tragic and comic”, and that’s steered the tone of the game. “Though it all bends towards an inevitably sad conclusion and the end of times, episodes within the grand narrative of Norse legend have pranks, mistaken identities and trickster figures,” said project lead Olof Björk. In battle, the hero you control during exploration and questing will lead an army against enemies including giants and “giant wildlife”. They’ll gain experience in encounters, and can be outfitted with banners which enhance their abilities. A selection of races and classes means heroes will be customisable to the extent we expect from RPGs – and those choices will define the way players experience Runemaster’s six worlds. Runemaster will be out next year. In the meantime, I’m perfectly happy to sit back and let the Viking RPG become its own subgenre in the wake of The Banner Saga. How about you? There: I’ve made a tag to help things along.